Detection, then correction. Air leaks can be found throughout a residence. To eliminate them, you need to know where to look and exactly what sealing techniques to utilize. 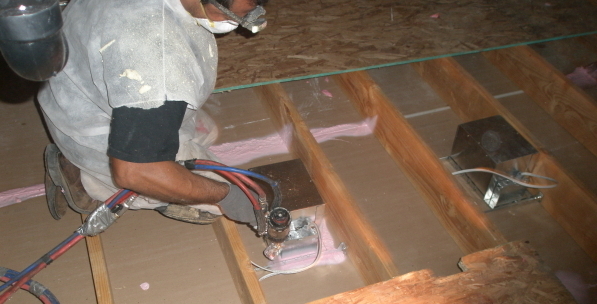 Air sealing is the procedure of sealing leakages in a home’s building envelope to limit the quantity of air that leaks out of and into your home. Conditioned (heated or cooled) interior air leaking out of the house is called exfiltration. Outdoor air that leaks in is called seepage. The majority of air exfiltration happens through the attic. The basement or crawl area is a major source of air infiltration. How leaky is your residence? There’s no doubt that air leak wastes energy and enables specific rooms to get too hot or too cold at particular times of the year. By utilizing a giant calibrated fan to depressurize the residence, the energy professional can actually measure air leakage and “see” various leak places utilizing tools like smoke pencils and an infrared video camera. Tri-County Insulation & Acoustical Contractors has the training and experience to do air sealing for your new home or building. We have actually gained our air sealing competence by carrying out “before” and “after” blower door tests to verify remarkable enhancements in building tightness. Call us today for am air sealing test for your home or building.